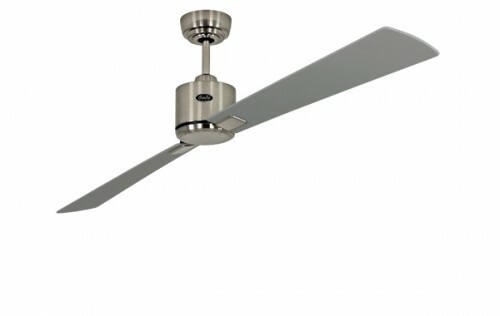 Energy-saving ceiling fan Eco Neo II 180 cm / 71" brushed chrome blades white / light grey Ceiling fans for domestic and professional environments Direct Current DC Ceiling Fans > 160 cm / 63"
» > 160 cm / 63"
In many rooms ceiling fans are not only used for cooling on hot days, but also during winter in order to reduce heating costs with recirculation of warm air. 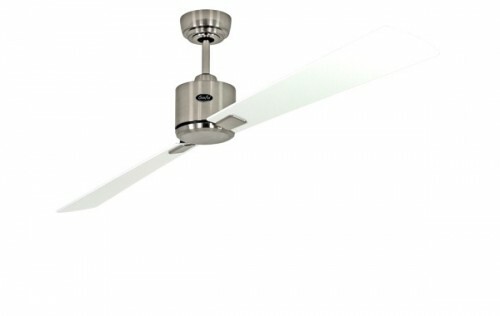 This energy-saving fan further lowers energy costs thanks to the direct current motor. 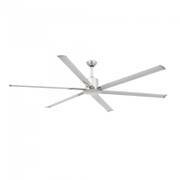 The 6 rotation speeds of this modern and innovative fan can be comfortably regulated with the included remote control. This model version with its housing in brushed chrome has included blades with dual design. 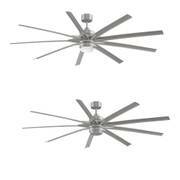 You decide, whether the white or grey side of the blades matches your interior design better. 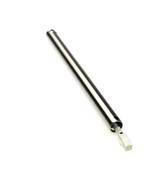 The reversible blades can be installed with either side showing. Energy-saving ceiling fan Andros Nickel 213cm / 84"
Fanimation DC LED ceiling fan Odyn Brushed Nickel with remote control 214 cm / 84"